Now that the conference is over, and all 900 attendees have boarded cars, buses, or airplanes, flinging us back to our various homes across the world, I can reflect on the experience. This was my third International Fragile X Conference. I attended in 2008 in St. Louis, and in 2010 in Detroit. The boys were three, and then five years old. Still pretty little. 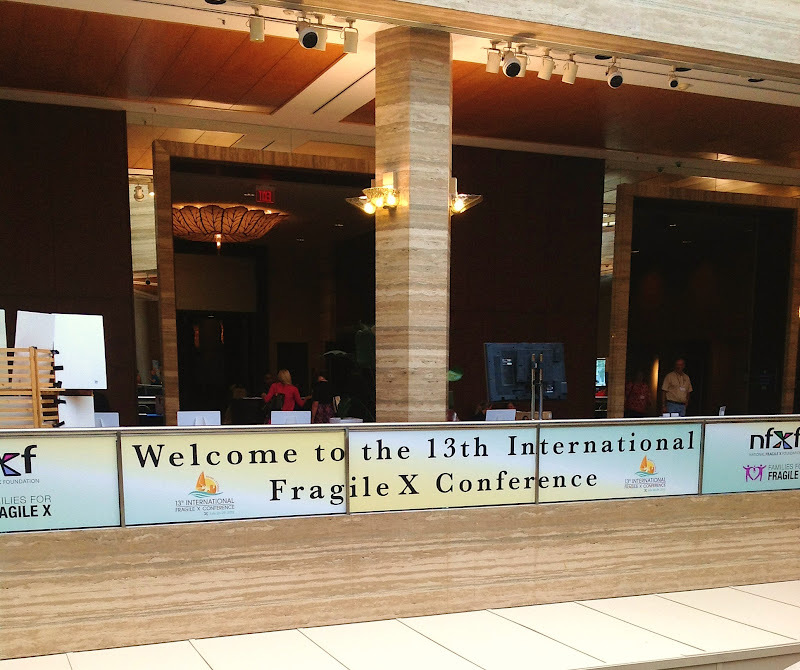 The St. Louis conference in 2008 was my first exposure to big kids and adults with Fragile X. It was hard to see how affected they were - how clearly not "normal" they were, and know that my boys, barely more than babies at the time, have the exact same disorder that makes them that way. But the speakers, doctors, and researchers at that conference were full of enthusiasm and all-out excitement about the new drugs and recent scientific breakthroughs in Fragile X research. There were medications that could provide treatment that helped like none before them, and some people were even throwing the word "cure" around. So it was easy to look at those big kids and grown-ups with Fragile X and separate my children from them. They were great, wonderful people, but my kids weren't going to be like that. It was too bad that those affected people had been born so long ago, back in the 80s and 90s, when they didn't know as much about the brain and development and there weren't as many types of therapies. I listened to brilliant professionals talk about the new medications being developed and the amazing results they were seeing in the trials, and I felt real hope that my boys could grow up to be "normal." Two years ago in Detroit, it was much the same. My little five-year-old guys had been doing so well in their ABA therapy. They had great preschool experiences and their teachers were full of promising, glowing reports of their progress. They had come so far. I knew there was more progress to be made, more studies needed, but I felt stronger in my hope that they could grow up and have a level of intelligence and independence that frankly, I didn't see in the grown-ups with Fragile X I'd met so far. Then came this, my third conference, in Miami. The first session I attended was called Mrs. Rogers Neighborhood -- life experiences, suggestions, and coping strategies by the lovely and vivacious Cindi Rogers, a mom of two adults with Fragile X. The beginning of the session covered schedules and planning techniques. People with Fragile X are very attached to their routines, and their sky-high anxiety levels off if they know what is coming up, how long it will last, and what is going to happen next. Pictures schedules are a great way to show them what is going to happen and what is expected of them. (I personally find picture schedules overwhelming. We have tried it off and on, but I get tired of there being 292 little laminated pictures all over my house, all with peanut butter and Doritos smudges and teeth marks. I can never find pictures in my stash to represent what I want to show the boys, so every day I'm making more of them. More tiny pictures to be thrown on the floor a dozen times, until finally the vacuum cleaner gets clogged with them. So I've found an app for the ipad that lets me make an electronic picture schedule. It's called Choiceworks. I love it. Then she showed videos of her sons, all grown up and in their 20s, at their jobs. Her younger son arrives at work, puts his lunch bag in a certain spot, and gets ready for work. Then he has to go jump in the corner for a minute, to "find himself in space." My heart hiccupped, because jumping like that, he looked just like both my boys. Only in a grown up body. Then the video showed him skipping happily down a hallway, on his way to pick up his broom and sweep the floors, just like he did every day at his job. He didn't walk or run, he skipped. And he looked exactly like a grown-up Zack. Skipping and hopping every where he goes, never walking. And I couldn't hold it in. I didn't move or make any noise. I didn't breathe any differently. But the tears spilled over and streamed down my cheeks. I didn't look to my left or my right, because I didn't want any sympathy from anyone, or I'd have completely lost control and the whole room would have known. I touched my cheeks briefly to clear them, looked at my phone as if I'd had a message, and got up and left. I composed myself in the hallway but went straight up to my hotel room, where I had a breakdown for about 20 minutes. So in any pictures taken that first day that you might see, if my face looks especially puffy, it might not just be chubby chipmunk cheeks. It might be because I wept hard and swelled my eyes up good, first thing in the morning on the very first day of the conference. It's not so easy anymore to separate my boys from the grown-ups with Fragile X. Zack and AJ have the same behaviors, the same mannerisms, as those grown ups. They aren't babies anymore, soft and pliable and unformed. They are seven. They are strong and sturdy, and becoming the people they are going to be for life. There are glimpses of the adults they will be. And the adults with Fragile X that I see are starting to be an all too real indication of how they will be. I want to appologize to my friends who have children who are adults with Fragile X Syndrome. I don't mean to offend anyone. This is just a very honest tale of what I guess is my journey to acceptance. We've had a diagnosis of Fragile X for a little over six years now, and I'm obviously not really there yet. I don't think I even realized it until Cindi's session. Once I got past the first day, things were easier. Part of what's wonderful about the International Fragile X Conference is just the experience of being in a place where everybody knows your name. Where everyone has kids just like yours. Where it's completely ordinary to see kids riding the escalators and elevators as if they were amusement park rides, laying on the floor working on an iPad, falling over on the floor to hollering, refusing to move. It made me want my boys to be there, just to experience that feeling of fitting into society. Where people think the odd behaviors are cute. I met so many friends - people I've been calling friends for a long time, even though I only knew them from their blogs or from Facebook. I love knowing people personally who are on the same path as I am. Sometimes I wish the whole world could be like this - the way it is in the hotel during the conference, surrounded by other carriers and full mutations. If only the level of personal connection, acceptance, and knowledge that I have here could exist in the real world. Everywhere I looked, I saw people who have children with autism; with hyperactivity; with intellectual deficits; with sensory processing trouble; with debilitating anxiety; indeed, with Fragile X Syndrome. It wasn't unusual there; it was usual. There were low points, definitely, but there were more high points of the conference - like the Miami Marlins baseball game, attended by 400 Fragile X parents and professionals. 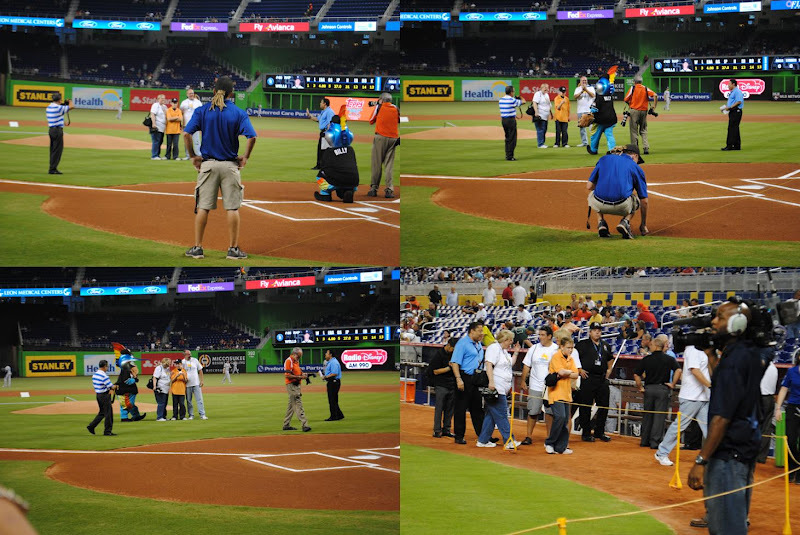 We watched as Glenn Sheldon, a 13-year-old boy with Fragile X Syndrome, threw out the first pitch of the game. We all felt the pride and joy in watching him succeed in doing that as much as we would if it were our own children. Another highlight was the special screening of Mission to Lars, a documentary made by the brother and sister of Tom Spicer, a man with Fragile X, about his lifelong dream to meet Lars Ulrich, the drummer for Metallica. The film did a great job in showing how Tom's anxiety is truly a disability, as he had to overcome one barrier after another in their journey. The audience all knew Fragile X inside and out, so we felt his pain and cheered hard for him once he finally succeeded in his Mission. Click here for more information on this great documentary. Many, but not all of the Minnesotans who attended the conference. I think for me, each experience - each conference - builds on the experiences I've already had, and it's hopefully bringing me to a point where I can accept the boys and whatever future they will have. Coming home was a odd experience, since you go through such an intense, emotional, life-altering experience there. I felt like I'd been gone a lot longer than five days. The landscape seemed very different, foreign, somehow, for the first few minutes. By the next morning I had fit myself back into my groove, and the kids and I are back into our routine. With, possibly, a few additions and changes to incorporate what I learned at the conference! Thank you for sharing, Bonnie. Your description of the first day of the conference had me crying right along with you.